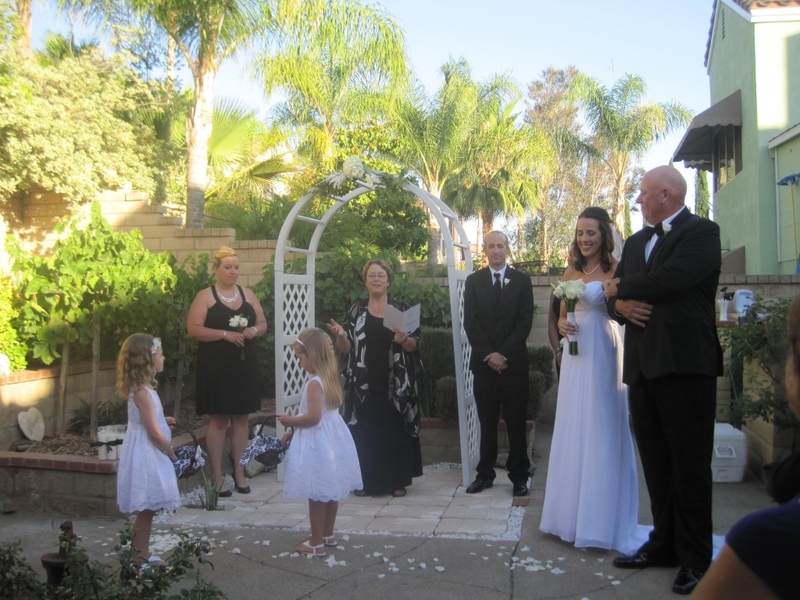 As a wedding officiant in Southern California, it’s so much fun when families take advantage of a beautiful back yard as their wedding venue. It is much calmer and a great setting for family members of all ages to enjoy the day. I walked into this family home about 30 minutes before the wedding. Kids were playing. Grandparents, uncles and aunties were in the family room enjoying appetizers. Friends were on the patio sitting around tables catching up with each others lives. Everyone was enjoying their moments together and the bride and groom were away with the photographer taking pictures. As the wedding time approached, the house filled with excitement as word spread that young couple had returned. Family members lined up. The order was posted hear the back door and the wedding began. Here is a picture of the first words of welcome as the bride waits to be presented by her dad. Backyard weddings can be beautiful, elegant venue to nurture warm relationships. Try a First Look at Your Wedding?